The system does not apply to other parts of the Taiwan, namely Kinmen and Lienchiang counties, and islands in the South China Sea. Example:Civic Boulevard of Taipei city. As a general rule, the odd numbers represent north-south highways and even numbers represent east-west. The numbers increase moving west to east and north to south. Major north-south provincial highways are indicated by a one-digit number. Special routes of a highway use the same number, followed by a heavenly stem character. However, for English translation, these characters are replaced by letters in the alphabetical order. National highways are freeways[nb 1]. The first controlled-access highway, and a predecessor to the national highways in Taiwan, was the MacArthur Thruway, built in 1964 between Keelung and Taipei. Construction on the first modern national highway, National Highway 1 began in 1971. The northern section between Keelung and Zhongli was completed in 1974, and the entire freeway was completed in 1978. It runs from the northern harbor city of Keelung to the southern harbor city of Kaohsiung, while there was an 8.6-kilometre (5.3 mi) branch (No. 1A) connecting to Chiang Kai-shek International Airport (now Taiwan Taoyuan International Airport). Construction began on the other freeways in the late 1980s. The northern section of the second north-south freeway (National Highway 3) between Xizhi and Hsinchu was completed in 1997. The No. 1A Branch was extended to link No. 3 Freeway at Yingge, Taipei, and renamed as the National Highway 2. Three other short freeways (No. 4, No. 8, and No. 10) were built to link the two north-south freeways in Taichung County (now part of Taichung City), Tainan County (now part of Tainan City), and Kaohsiung County (now part of Kaohsiung City), respectively. The entire No. 3 Freeway was completed in January 2004. To ease the congestion of No. 1 Freeway in the Taipei metropolitan area, a 20-kilometre (12 mi) viaduct was built in 1997 along the original freeway between Xizhi and the Wugu District of New Taipei to serve as a bypass for traffic not exiting and entering the freeway within Taipei. The construction of a freeway connecting the Taipei metropolitan area and Yilan County began in 1991 and was completed in June 2006. It includes a 12.9-kilometre (8.0 mi) tunnel (Hsuehshan Tunnel), which is the ninth-longest road tunnel in the world. An extension from Yilan County to Hualien County is planned. However, its construction is being delayed by environmental concerns. In January 2, 2014, the toll system was converted to a distance-based one. Tolls are no longer collected at toll booths but automatically by electronic toll collection (ETC). The pre-2006 Taiwan freeway exit sign. The 27 indicates that the exit is the 27th exit, calculated form the northernmost / westernmost point of the freeway. The post-2005 Taiwan freeway exit sign. The 27 indicates that the exit is located at the 27th kilometer, calculating from the northernmost / westernmost point of the freeway. Provincial expressways also allow it in 2007. Every one tenth of a kilometer is marked on the freeway with Arabic numerals to indicate freeway mileage; that is, the number of kilometers away from the northern end or western end of the freeway. Exit numbers are based on the freeway mileage. With the notable exception of exit-only signs, which are only expressed in Chinese (but with a right arrow indicating an exit-only lane), exit notification and system route reminder signs in the freeway system are almost identical to their US counterparts. A diagram that distinguishes an exit only lane from the regular lanes. The exit only lane has a right-turn arrow symbol and Chinese characters that say "Exit exclusive lane." There are four types of exit notification signs. The first notification sign appears two kilometers before the exit, providing the destination name and an Exit 2 km notice. The second sign appears one kilometer before the exit, providing the destination name and a Right Lane notice. The Right Lane notice warns the exiting driver to start switching to the right lane in preparation to exit and does not necessarily indicate that the right lane is an exit-only lane. The third sign appears a few hundred meters before the exit, providing the destination name and a right tilted arrow. The fourth sign is located at the exit and says Exit with a tilted right arrow. Sign that indicates that the exit is two kilometers away. Sign that indicates that the exit is one kilometer away. Exit notification signs were slightly altered in December 2005. The green exit mileage label on top of the exit notification sign has been replaced with a yellow exit mileage label accompanied with the Chinese code name of the interchange. The Chinese code name of the interchange does not necessarily reflect the destinations listed on the exit signs and may represent the general location of the freeway interchange. Long rectangular-dash dividers usually separate normal lanes. Short rectangular-dash dividers usually indicates a lane that is ready to turn into an exit, a merging lane, or a lane reserved for vehicles that have difficulty climbing high grade regions of the freeway. Freeway entrances may have traffic lights to control the flow of vehicles entering the freeway. The speed limit for cars on Taiwan's freeways range from 80 km/h (50 mph) on Freeway No. 5 (north of Toucheng, Yilan) to 110 km/h (68 mph) on Freeway No. 3 (south of Tucheng, New Taipei). The speed limit for trucks are usually 10 km/h lower. In non-traffic jam conditions, a vehicle must travel at least 60 km/h (37 mph). Speed limits are enforced through radar activated cameras that take pictures of speed-violating cars. Because of protests, yellow warning signs are given in advance in Chinese of approaching radar activated cameras. Despite these warnings, speed violators continue to be captured by cameras. Longer following distance is required in the Hsuehshan Tunnel. In the tunnel portions of freeways, lane change is prohibited when the lane divider consists of two parallel solid lines, used when lane change is considered unsafe should a collision cause a vehicular fire. Headlights must be turned on when traveling through tunnels; this is enforced by special cameras. Unlawful lane change or failure to turn on headlights in a tunnel is subject to an administrative fine of 3000 new Taiwan dollars. Additional restrictions apply for the Hsuehshan Tunnel on Freeway No. 5, which is the longest tunnel in the entire system. Military troops marching or conducting drills. Motorcycles (see also Restrictions on motorcycle use on freeways#Taiwan for more information). Three-wheel motor vehicles or motorized pedicabs. Motorized machineries not being motor vehicles. Towed vehicles not disabled on the freeways or expressways. Odd-numbered freeways have tolls, which are automatically collected by ETC. The current rate for cars is (NT$1.2/km up to 200km) + (NT$0.9/excess km), km being kilometers traveled per day. The first 20 km per day is free and thus deducted from the distance. Freeways may be used directly, but users are advised to apply for an “eTag”, which is free and when equipped gives 10% discounts and allows you to store pre-paid money for tolls. The eTag can also be set to pay tolls automatically with credit card or a savings account. Users without the eTag pay tolls at convenience stores 3 days after usage and if not, bills will be mailed to car owners. Freeway service and rest areas start appearing south of Taoyuan City on the No. 1 and No. 3 freeways. Most rest areas provide gas stations, gift shops, convenience stores, and food courts. The Qingshui rest area located on the 172.4 km mileage marker of National Highway No. 3 is so popular that visitors can only park for 45 minutes and are prohibited from barbecuing. There are eight national highways as of 2011. They are administered by the National Freeway Bureau. 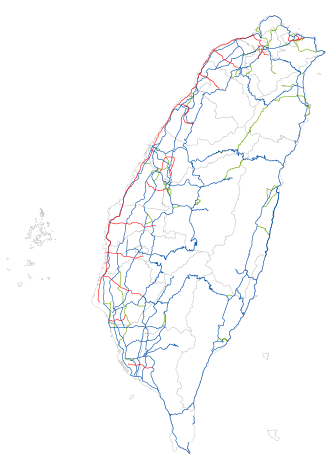 Provincial highways (of Taiwan Province) are administered by Directorate General of Highways under Department of Transportation and Communications since 1999. Before the mid-1990s, the route numbers of provincial highways were limited to 1–27. In the 1992, planning started for 12 east-west expressways and the West Coast Expressway, indicated by route numbers greater than 60, to ease the congestion in the freeways. Some of these expressways are still under construction. Many of these provincial highways cross through the special municipalities (i.e. Kaohsiung, New Taipei, Taichung, Tainan, Taipei) which are not part of Taiwan Province. Officially, provincial highways are now known as Taiwan highways, but many people still refer to them as provincial roads (Chinese: 省道; pinyin: Shěng Dào). In 2007, provincial expressways started using the same exit notification signs that national freeways started using in 2006. 1 (Taipei - Fenggang, Pingtung): This is the historical north-south highway (縱貫公路). 2F (Dawuluan, Keelung - Keelung Harbor): An extension of 3 Freeway. 8 (Dongshi, Taichung - Taroko, Hualien) (Central Cross-Island Highway, 中部橫貫公路): This highway was severely damaged between Guguan and Deji by Chi-Chi earthquake in 1999 and is unlikely to be restored in the near future. 9 (Taipei - Fenggang, Pingtung): The highway runs through the eastern part of Taiwan. It is the longest highway in Taiwan. A trial program to allow a motorcycle with a cylinder capacity of more than 550 cm3 on Provincial Highway 68 and Provincial Highway 72 started in January 2005 for one year and was extended an additional year. On July 2, 2006, more than 1500 Taiwanese motorcyclists took to the streets in Taipei to demand more open highways; Provincial Highways 68 and 72 were the only Taiwanese expressways open to high-end motorcycles. Since 2007, a motorcycle with a cylinder capacity of at least 550 cm3 may be driven on expressways but not freeways. This major change has resulted in mixed reactions. County and City Highways are numbered from 101 to 205 since the numbered highways in Penghu (Pescadores) are incorporated into the system. Including those branch lines, there are totally 147 County and City Highways, and the total length stretches over 3,500 kilometres. The lowest number 101 is in New Taipei City. The route numbers generally increase moving north to south. Route No. 200 is in Pingtung. Routes No. 201 to 205 are in Penghu. While, County Highway No. 179, 184, 195 does not exist. A Township or District Road is prefixed the abbreviation of the county or city in a Chinese character where it is located. For example, the sample signs above show Hsinchu Roads No. 22, 21, and 23. Special Roads in Taiwan are rarely used and appear in certain places. ^ This term "freeway" means "free of signals", not "free of charge"
^ "Da Ai Headlines for May 2, 2011". Da Ai World News. 2011-05-02. Retrieved 2012-01-10.